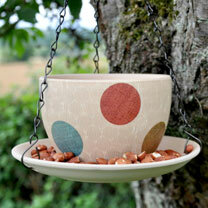 Hand Painted in pastel colours, this quirky polka dot pattern feeder is made from clay and will brighten up any garden. Supplied with a black chain, coated with durable weather resistant paint, for easy hanging. This feeder also provides birds with water. Fill the cup with fresh water and use the saucer for bird feed. Cup Dimensions 15 x 17 x 17 cm.